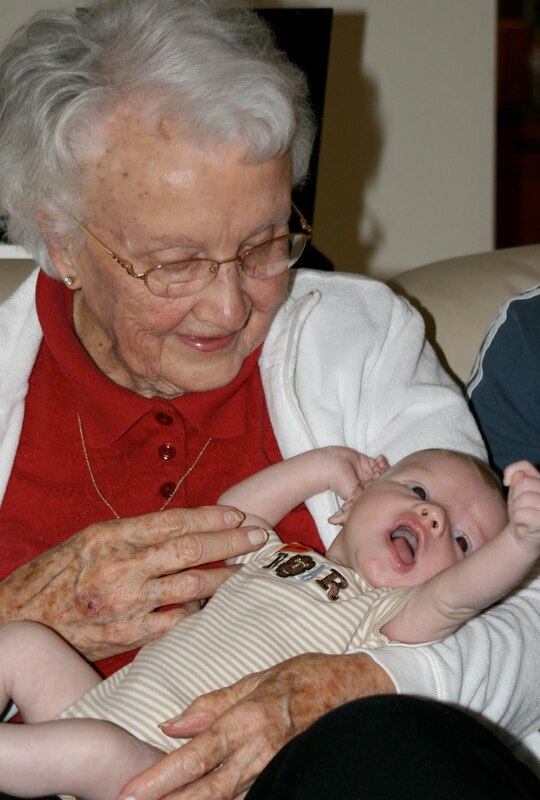 One-month-old Walker Vincent Skupien performs newborn calisthenics for his great-grandmother at her recent ninety-first birthday celebration. My mother celebrated her ninety-first birthday June 12 at our home. Her physical stamina has diminished, but the love that defines her character burns as brightly as ever, enveloping her family and friends. She does, on occasion, express regrets about no longer being able to do the things for other people that gave her such satisfaction in the past. But the concern and love that directed her actions in the past still touch the lives of others. Hence the title of this post: She is 91 and her life continues to count in wonderful ways! Wow, 91 years...that's great! Your grandson is so alert looking for a one month old. I love the picture of the two of them together--each at two very different stages of life.